Goalkickers: H.Dunn 4, H.Davie 2, H.Clover 1, C.Davey 1, L.Johnson 1. 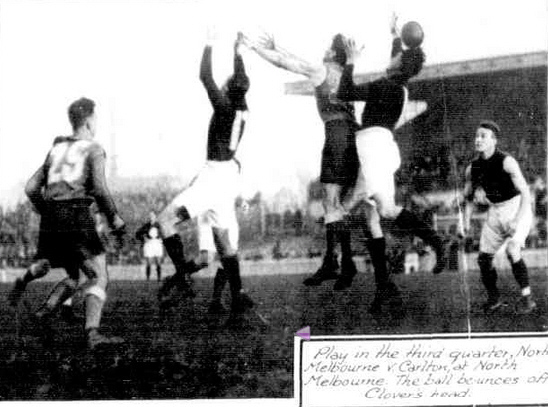 Former vice-captain and 1927 leading goal-kicker Harold Carter played his last match for the Blues this day. At the end of this round Carlton were in 2nd spot on the ladder with a percentage of 156.0. Contributors to this page: blueycarlton , pblue , Bombasheldon , PatsFitztrick , molsey , timmyd , WillowBlue , camelboy and admin . Page last modified on Saturday 26 of April, 2014 05:11:57 AEST by blueycarlton. 2019 - Matthew Cottrell at training. 1996 - Parkin: Selfish Blues (31/07/96).